COLEMAN YOUNG II RUNS FOR DETROIT MAYOR; DUMP DUGGAN! The Voice of Detroit does not make a habit of endorsing political candidates. But former State Senator Coleman Young II had some good points to make when he announced Feb. 24 that he is taking on “the white mayor, the right mayor” as Rev. 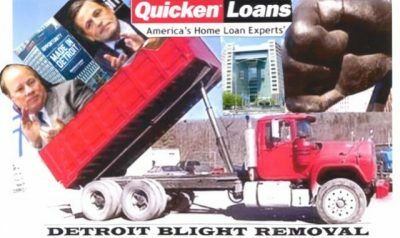 Wendell Anthony had the gall to call Mike Duggan when he introduced him. Many of Senator Young’s points were raised in VOD’s earlier article “Duggan’s Decades-Long Detroit Demolition Derby.” It will take a GRASS ROOTS people’s movement to oust the white aristocracy and banking establishment that has the City of Detroit and the Detroit Public Schools in its clutches, with the devastating bankruptcy under Emergency Manager Kevyn Orr and Gov. Snyder. 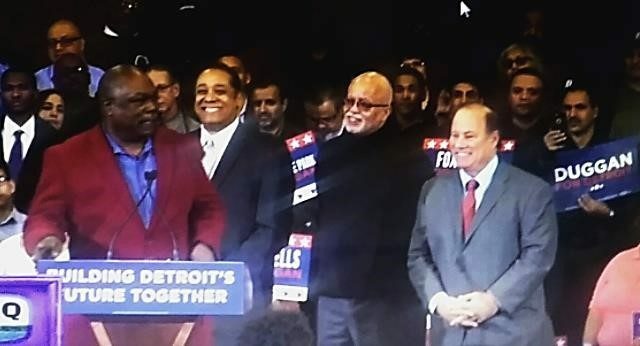 But more power to Young, maybe he can get the ball rolling. . . .
Wendell Anthony, Benny Napoleon and others support Duggan during his announcement.